Asteroid Rider is a free Windows 8 game app in which you have to collect all the stars in the space and gain points. Collect as many stars as you can to make maximum points. This free Windows 8 game app is a single level game and has easy game controls. The app’s screen takes you in the space where you have to control a rocket to collect stars. As obvious, this game also has obstacles. These obstacles come in the form of big and small pieces of rock called Asteroids that either remain still or keep moving here and there in the space. The challenge is to collect stars while avoiding the moving asteroids. Because if you hit them by any chance, you will be killed. Asteroid Rider is freely available in Games category of Windows Store. You can search for the app in Windows Store using Win+Q key combination. To view it directly in Windows Store, click on the link given at the end. Let’s see how this free Windows 8 game app works. Asteroid Rider is a nice game to kill your free time. The graphics are pretty fine and clear. To play this game, first install and launch this app on your Windows 8 PC. As you land on the app’s Start screen, you will find simple instructions to play on this screen itself. Press Space bar or tap on the requisite place on the Start screen to play the game. 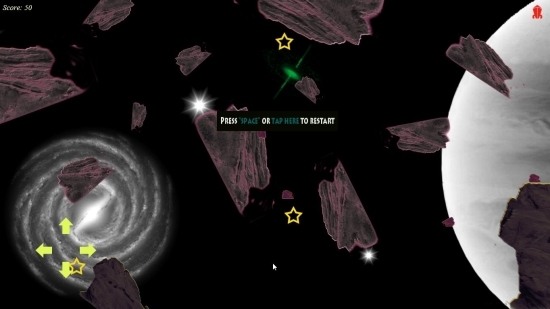 The game screen will appear as space full of still and moving asteroids. Again Press Space bar or tap on the requisite place as instructed. A rocket will appear on the extreme left side of the screen. Use left, right, top, bottom headed arrows on the keyboard to move your rocket. 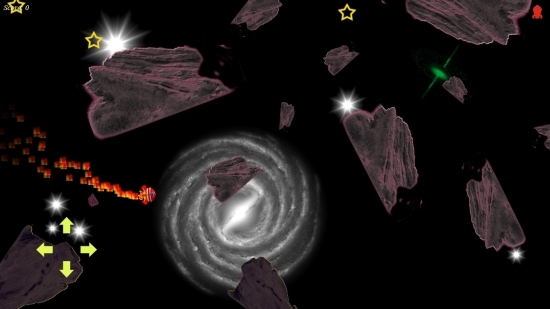 Collect as many stars as you can escaping the still and moving asteroids. Your scores will be displayed on the top left corner of the screen. Be careful not to hit the asteroids as they will destroy your rocket and your game will be over. Some other free Windows 8 games you can try: Plumber3, Building Tower, and The Gunstringer. 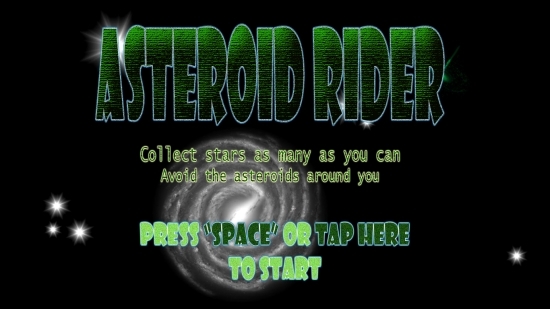 Asteroid Rider is a simple game app with easy game controls. Though the game looks simple but you have to manage the fast moving rocket very carefully to escape the obstacles that appear in the form of Asteroids. That means, to control the fast moving rocket is the real challenge. Give it a try and share your feedback via comments.